If you would have asked me at 19 if I would ever get a tattoo the answer would always be ‘no way’. I didn’t really get the entire concept of a tattoo and thought it was a phase some of my college friends were getting into. However, my entire life, I would always get asked about a scar I had on my neck. It’s more noticeable when my hair is up in a ponytail because it runs along my neckline. “Were you bit by something?” “Oh my gosh did someone stab you?” strangers would ask me. It would get tiring going into my ‘miracle story’ ( one that I’ll save for another time ). All I knew is I wanted to talk about in a different way. And so, my tattoo idea came alive. I researched, designed and saved my waitress and babysitting money I had earned while attending classes in school and soon, I had enough and felt confident that this was going to be what I wanted to share with people the rest of my life. It was meaningful, it was a tribute and it was definitely me. I had a few of my best friends come with me for moral support and within an hour and a half I had my dream design. What is it you ask? The purple heart in the middle is a tribute to preemie babies. 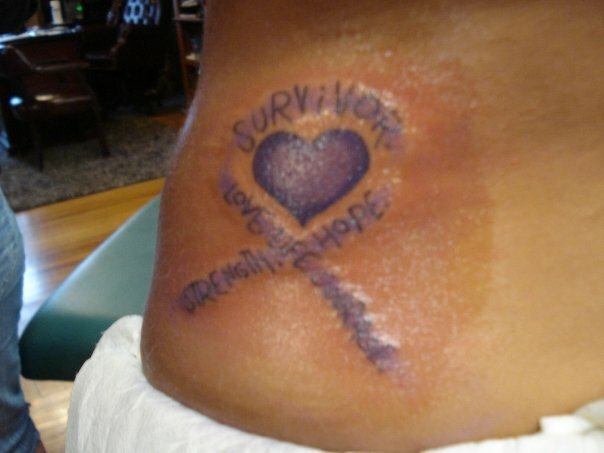 The words ‘strength, love, courage, and survivor’ are words to describe my every day life, the strength I had to be here today with a 10% chance survival rate when I was born and courage to endure every obstacle that comes my way. My parents freaked when I showed them a few weeks later and looking back I can understand since I had been against it at first. I explained my reasoning and they, although not a fan, understood. I wanted to explain my tattoo to people rather than the scar itself and I get many comments and compliments about it to this day. Add to that, a second tattoo that my sister and I each got together two years later. My parents almost fell out of their chairs! We had never been close growing up but traveling to Europe for an entire month together changed that and we became best friends through the journey. We each had sister written in our favorite language; hers French and mine Italian with an infinity sign symbolizing eternity. Do I regret my tattoos? Never. They are in places where I am never questioned about them unless I’m wearing a bathing suit in the summer or not wearing a watch. They represent me, my life and what is meaningful to me. Some ask “what about when your daughter gets older?” I’m happy to explain to her what they mean and more importantly what they are to me. My survivor tattoo did stretch a bit since having my daughter but I love that my stretch marks add to the greatness of that tattoo. When I’m 90 years old and I look at my wrinkled body, I’ll still love them. I love everything about this post! I don't have any tattoos, but maybe one day I will! Thanks for sharing! So neat! 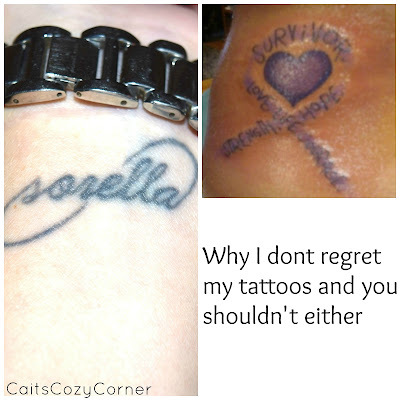 I have one tattoo that I had touched up and they scarred my wrist! There is a puffy line going through it thats white. :( So mad! Other than that, I wouldn't change mine.